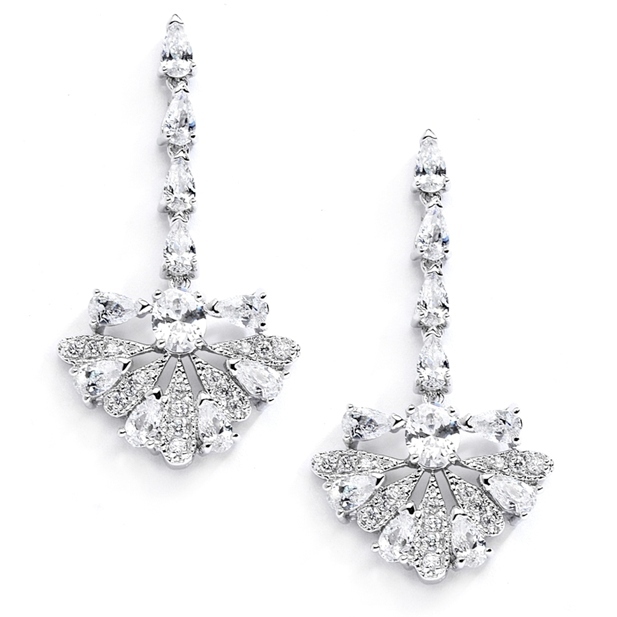 * Mariell's heirloom quality Cubic Zirconia bridal earrings are 1 5/8" h x 3/4" w and feature intricate jewel encrusted Art Deco fan designs. * They are plated in Genuine Silver Rhodium and are sure to look like priceless family jewels at your wedding! * Your brides who adore vintage or heirloom jewelry will fall madly in love with these unique Art Deco Fan Design Cubic Zirconia Wedding Earrings. * These magnificent dangle earrings looks like a vintage heirlooms and will be mistaken for priceless family jewels. * The rhodium plating will guarantee the quality of this piece for decades to come! * Retailers and stockists, be sure to add these wholesale Art Deco earrings to your wholesale display for your brides who demand the very best!